The last two days have been pretty rough. I forgot how hard it is to stick to my Points. I have been overly exhausted the last few days because I think I have another sinus infection. That always seems to wear me out. Of course by 7pm I need to munch to stay awake. I guess it is just another one of those things I need to work through. 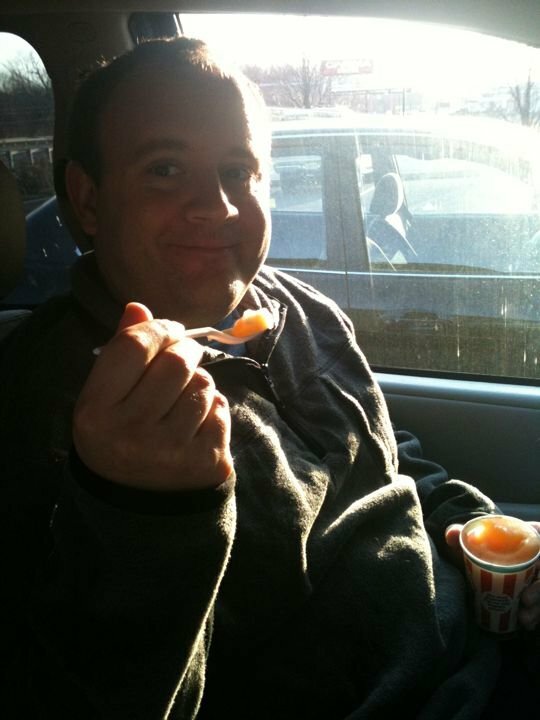 On Sunday I did awesome until after dinner when we decided to go to Rita's and get our Free Rita's ice. Check out the pics! 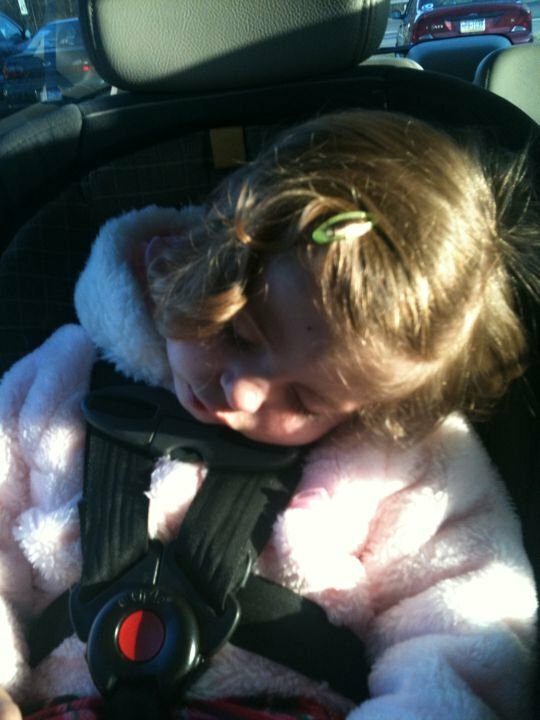 Poor MJ fell asleep before she got to try her ice. 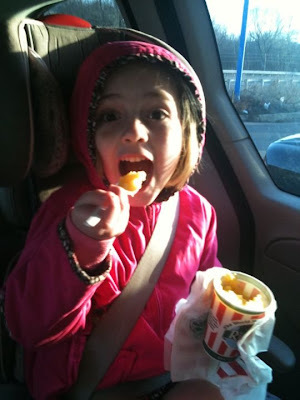 Maddie loves her Mango Ice! 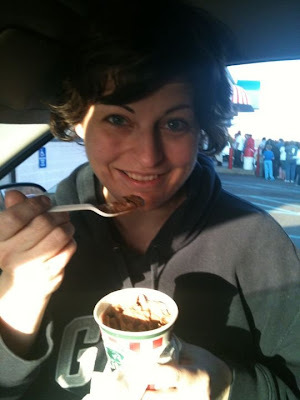 I of course had Fudge Brownie Cream Ice. It was the best Rita's ice I have ever had. It has big brownie chunks and mini chocolate chips in it. It was amazing and I am sure really, really fattening. Unfortunately this isn't where my night ended. We ended up going grocery shopping after Rita's to pick up a few things. I picked up some Ritz chips because they were on sale 3 for $7 and when you bought 3 you got a free 15 oz jar of Cheeze Whiz. Unfortunately I have a weakness for Cheeze Whiz. That night I ended up opening the Ritz chips and dipping them in the Cheeze Whiz. I wasted 21 Points on it. I can't believe I did that. Then yesterday I did great again and ruined it at night buy eating 2/3 of a bag of Pirate's Booty and 6 of my Mom's homemade cookies. Mindless munching is the worst. My goal for tonight is to stop the mindless munching. I will save 3-4 points for a nighttime snack after dinner and then go to bed. As of today I have used all but 1 of my Weekly bonus points. If I want to lose weight by my weigh-in on Friday I really need to be strict. I only have 30 points per day and if I get some energy back I will try to pick up a few extra points by exercising. - No time to eat. I've had to stop buying the foods that I mindlessly munch on. Now I do get frustrated when I go to the cupboards hoping for crackers or something and foods like that aren't there. I know it saves me in the long run though. I think my kids also don't like not having those foods around much but I know we are all better snacking on fruits and veggies instead. Good luck to you! I love the term "mindless munching". Been there, done that! 21 points on Cheez Whiz and chips - ugh, that's gotta hurt. Why do we go ahead and add up the points anyway? I do it, too, and regret every point. Good for you for counting the points. We will never change our bad habits until they stare at us in our tracker I am convinced. It hurts when we write it down, but then it tells us what we need to change if we don't lose as much as we wanted to. That is a big step. I feel your frustration, but as the previous poster said: Good for you for counting the points. While it may have been mindless munching, at least you took ownership of what you'd done afterward. So don't beat yourself up over it...just regroup and move on to the next day. Recently read a dieting article with Dr. Oz. I know very little about him, but one of his tips was to "recommit every day." I really like this attitude...each day is its own start, and if you say at the beginning of the day, "Today, I'm going to snack less," maybe you will! Thank for all of the suppport!